Turn breakfast into a meal everyone's going to love (seriously, who doesn't love chocolate and peanut butter)! 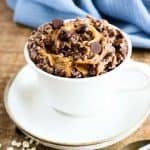 This Instant Pot Chocolate Peanut Butter Quick Oats recipe is so quick and easy, there's no reason not to make it. Spray bottom and sides of inner pot with nonstick cooking spray. casserole dish that will fit on top of the trivet. Mix together quick oats and almond milk. time of 5 minutes. Once cooking time has elapsed, do a quick release. Add mix ins to the oatmeal and serve.